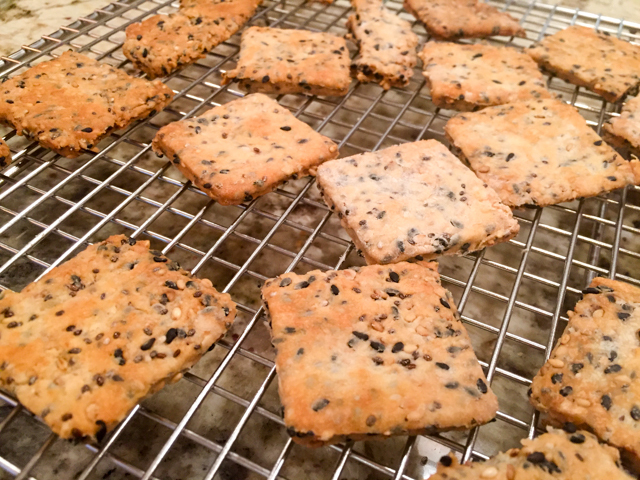 SEEDY CRACKERS FOR A FUN PARTY! Remember The Secret Recipe Club? Oh, how I miss those fun times… But, even if it’s over, many of the virtual ties made over the years stayed strong. One of the “secreters”, Sid, has just published a nice cookbook, and organized this Virtual Tapas Time Party in which bloggers pick one recipe to highlight, everyone posting together today. 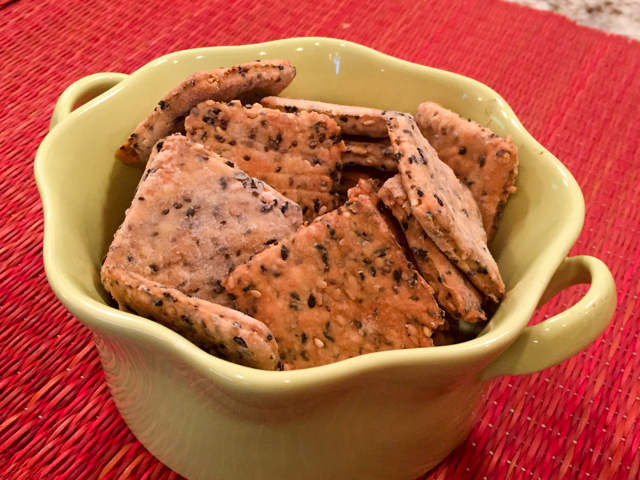 I am thrilled to be part of it, and share with you a delicious take on crackers. They leave anything you can buy at the store in a smoke. They are hearty, tasty, crunchy, and I must also say… addictive (sigh). Some serious self-control is needed. They are awesome even naked. Yeah, some jokes come to mind, but I’ll exercise self-control there too, and skip them. Mix all ingredients together, and let rest for about 15 minutes. Divide the dough into either thirds or quarters, and roll out each piece 1/8 thick. Cut into squares and place on a baking sheet. Bake for about 12-15 minutes, or until the crackers start to brown around the edges. Remove from pan, cool on a rack and serve. Comments: I rarely make crackers. Some of the store-bought products are so good and convenient, I truly do not mind opening a package and serving them at dinner parties. Take Ak-Mak, for instance. They are simply perfect with hummus, cheese, tapenade. But Sid’s book gave me the push I needed to bake a batch, and I must admit, they are much, much better than those commercially available. Plus, you can customize them the way you like, using different seeds, or even some spices. And fun to make too. I could have rolled them a little thinner, because they do puff up a little during baking. It’s the baking powder speaking. Oddly shaped pieces should be baked too, I think they look great and the pointy edges are perfect to stab into a creamy spread. I share my two top favorites of each chapter, so you can have an idea of what the book is all about. SPREADS, DIPS AND MORE… Mini-Dried Cranberry and Pistachio Balls (they look adorable, and I imagine taste great). Jalapeno Popper Dip (definitely my kind of a dip). HUMMUS… A full chapter on my favorite appetizer in the known universe! Hard to choose only two, but here we go: Curried Carrot Hummus, and Chocolate Hummus (intriguing, but I bet it works, the combination of tahini with chocolate is becoming a classic). RETRO… Who does not like a good old retro concoction? Smoked Salmon Pinwheels, and Egg Salad Pinwheels make my list, most definitely. 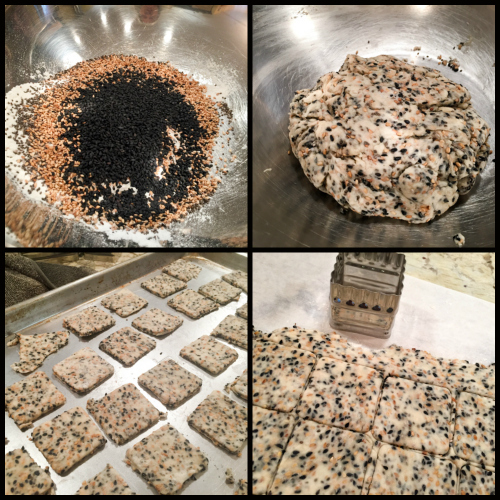 CRACKERS… The recipe I featured, absolutely delicious! The second contender which I almost made, Lemon and Rosemary Crackers. No justification needed. EGGS… Basic Deviled Eggs (I am addicted, always searching for new takes on it), and Snowmen Eggs, which would be a perfect culinary project to do with kids. WINGS AND THINGS… Cranberry-Orange Wings, and Chutney Wings called my name… I think chutney is one under-rated food, a bit retro perhaps, but so delicious! PLAIN FUN STUFF… Tomato Bites (adorable) and Vegetarian Potstickers make my favorite pair. I hope you enjoyed the featured recipe and the virtual tour of Sid’s book. 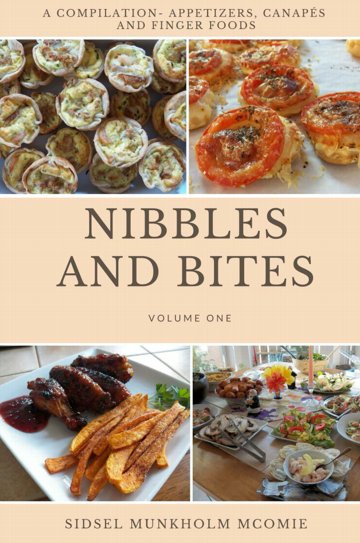 Make sure you stop by Sid’s blog to see what our friends made from Nibbles and Bites. THREE YEARS AGO: Secret Recipe Club: Tailgating Party! FOUR YEARS AGO: One Million Page Views! I fully intend to try these crackers. I love that all of the recipes in Sid’s book are so “doable”. true… all recipes are uncomplicated…. Thanks so much for coming to the party and bringing some of the Something Seedy Crackers. They’re my favorite and go so well with most spreads as well as taste good ‘naked’. I try to keep some on hand most of the time. they were wonderful, hubby went crazy for them! These crackers look wonderful! I love all of the seeds in there. It would be hard to not eat the entire batch! Lovely appetising looking crackers! yummm! they have perfect texture, very satisfying! I can’t wait to try these next…I’m with you…homemade crackers do really just taste so good and I love that you can tweak them to your taste and what you are serving them with! it’s a bit of work, but worth it! Very interesting, have never thought about making my own crackers!!! I wonder if any type of flour could be used? Yours look amazing !!! These look great, Sally. But why would you be eating them when you’re naked? And if you were, I hope that you weren’t in bed, because eating crackers in bed is known to occasionally get one thrown out. More seriously: the reference to Lemon Rosemary Crackers sent me looking for Sid’s recipe and blog. They, too, look great and are described with recipe at https://www.sidsseapalmcooking.com/2017/01/lemon-and-rosemary-crackers.html. Sid suggests using a pasta roller for the lemon-rosemary version: did you consider doing likewise with these?